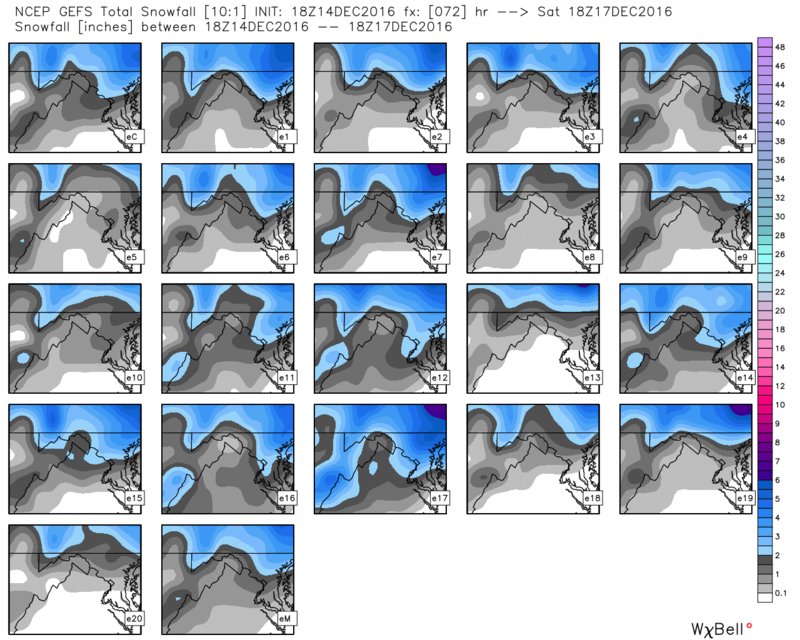 The NAM is currently more of an outlier with keeping the colder air entrenched longer producing more in the way of snow before a change over to sleet and freezing rain. This model is currently the fastest at pushing low-level cold air out of the area, lessening the impacts of snow, sleet and freezing rain as it depicts temperatures above freezing rather quickly Saturday morning. Colder than the GFS, but warmer than the NAM. Produces a “dry slot” pretty quickly on Saturday which is important because that could cut down on any accumulation but also “slow down” the warm air aloft from reaching the surface as quickly. So as you can see, the devil is in the eventual details here with exactly how much snow falls, and how much icing we get on top. 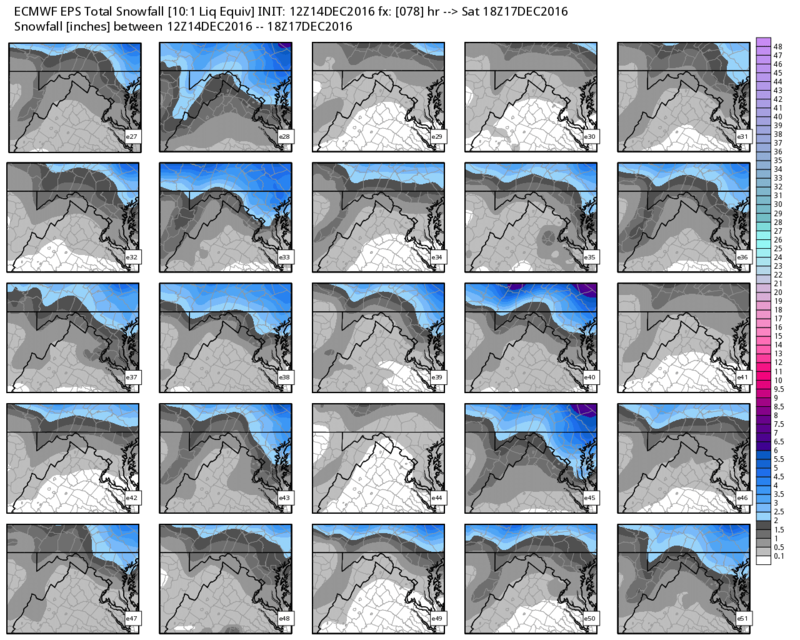 GFS Ensembles (for snowfall accumulation): Not looking very impressive at the moment, but then again is this model warming things up too quickly? Road temperatures on Friday night will definitely be below freezing with the bitterly cold antecedent conditions, therefore any freezing rain that falls late Friday night into the day on Saturday will create extremely hazardous travel conditions. I’m hopeful we get some consensus starting to really build in tomorrow once the arctic air has actually arrived here on the east coast. 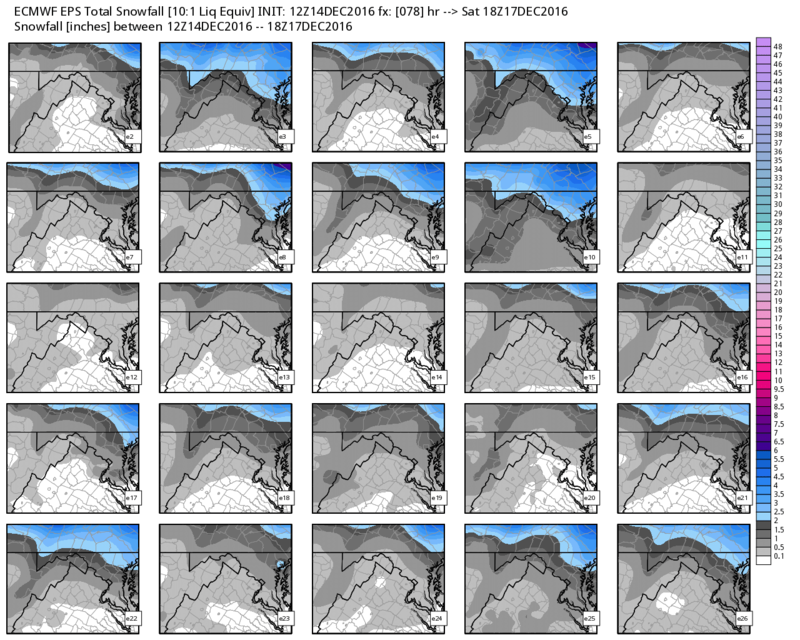 We might start getting better data from the Short Range Ensemble Forecast (SREF) packages. We will likely see “Freezing Rain Advisories” for Overnight Friday into Saturday with less than one-tenth of an inch of ice accretion, OR a “Winter Weather Advisory” for less than or up to 1/10″ of ice accretion and a dusting to one-half inch of snow. Do you think we will likely see winter weather advisories with this event due to cold road temperatures or does the amount of precip not meet advisory criteria?